Huge congratulations to Jo and Martin who were married at The Lawn, Rochford. 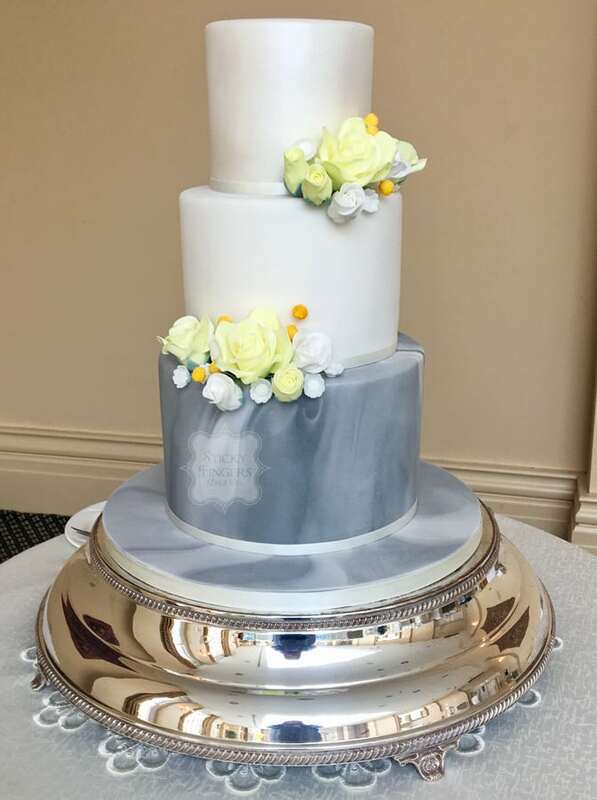 Their colour scheme was grey and lemon which I incorporated into their wedding cake – grey marble icing on the bottom tier with lemon and white sugar flowers matching Jo’s bouquet. Martin is a massive West Ham fan, so although West Ham’s colours didn’t match the colour scheme of the wedding, the bottom tier was in fact, claret and blue sponge inside! (Red velvet for the claret and vanilla for the blue). The other flavours they chose were lemon limoncello for the middle tier and finally strawberry & champagne for the top tier. I hope you had the best day ever and wish you a long and happy life together!